Depending on which Wikipedia entry you read, Thalia was a Greek goddess of comedy and idyllic poetry, one of the nine muses, and/or one of the three Graces responsible for rich banquets and festivity. The name ‘Thalia’ is Greek for abundance; perhaps Narcissus ‘Thalia’ was thus called because of the abundance of flowering heads on each stalk. It is this feature that makes ‘Thalia’ especially wonderful for vases. You don’t have to cut many stems in order to create the impression of abundance, and even with a sizeable number of stems taken from the garden, those double heads mean that the losses won’t be too noticeable. As the flower-heads open and mature in the vase, the colour fades from creamy white and that almost yellow centre towards pure white. The vase of ‘Thalia’ stands above the fireplace next to a print by the fantastic artist Natasha Newton, one of a pair that I recently bought and had framed, and that will eventually hang in my office. As described in my previous post ‘Some Flowers’ Of My Own, ‘Thalia’ is one of my favourite flowers to photograph, for her delicate beauty. If you stand very close in a quiet room, the scent is deliciously old-fashioned. 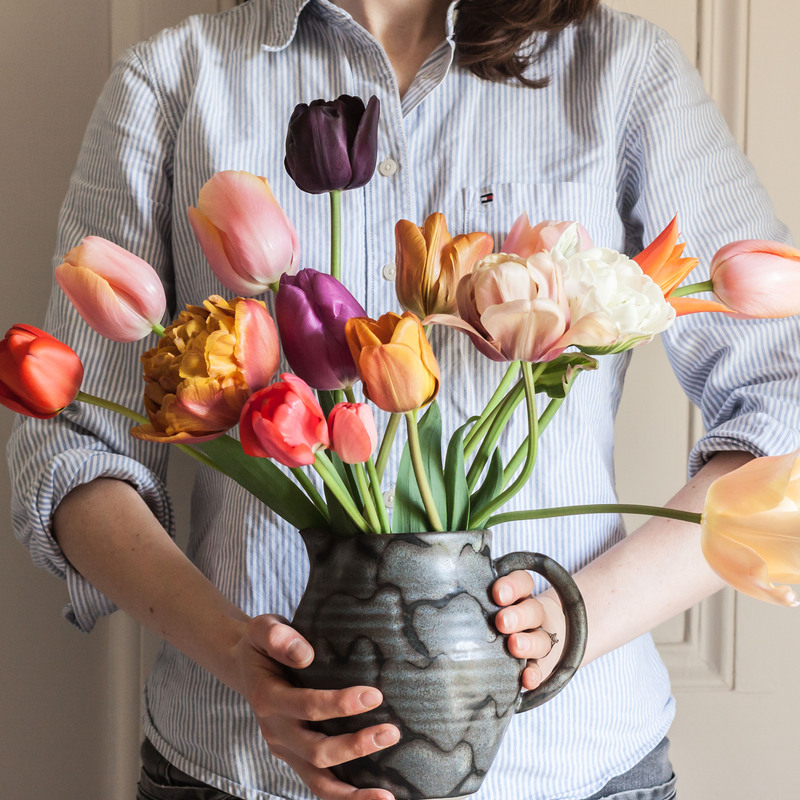 In a vase on Monday is hosted by Cathy at Rambling in the Garden and I recommend a visit to her page to take a look at all the vases created by gardening bloggers across the world today. Quite a lot of gardeners have posted about narcissus ‘Thalia’ and it is a lovely thing. I would like to plant it myself. Yes, this old favourite of mine appears to be the ‘in’ daffodil for 2018! I recommend you go out and plant it, as it is truly lovely and increases obligingly, so very soon you’ll have plenty. Thank you for your fascinating description of the meaning of the name Thalia. Your arrangement is beautifully simple with some interesting angles! Thank you for your kind comments – I am so glad you liked my arrangement. Thalia definitely has grace and poise and fits in with your decor and those pictures so well. Fascinating how different it looks in your vase compared to your prior post and photo with the dark background. I almost did not have recognize it as the same plant. And I think the colour of the background will have a great deal to do with that, but should add that those in the vase were freshly opened while those in the picture in my previous post had just peaked. I really enjoyed the description of it in your last post, Joanna, which encouraged me to have a closer look at mine. I need to add more for next year as they really are as beautiful as you suggest. Yours is a delightfully delicate little posy – thanks for sharing. Thank you Cathy. Have yours not bulked up? I bought ten bulbs back in 2015 and have now got at least 30. Beautiful, and one of my favourites. So prettily presented on your mantelpiece too! I love the scent if I manage to catch a whiff outdoors. Oh yes – I was weeding next to mine just an hour ago … it’s a still, sunny day and the faint scent was divine. Very elegant. I would not have thought of leaning them in the vase like that, but I will now! Thank you Susan – I hadn’t enough to stand them upright, and can’t stand it when my flowers splay out in all directions, stems akimbo! Thalia is lovely but may I mention Tresamble. It’s like Thalia’s sturdier cousin. Equally lovely but not so prone to damage by wind and rain. Yes, that does look like a lovely one. So many beauties to pick from, aren’t there. They are something I look forward to every year with great anticipation, Donna. I hope you enjoy them when they arrive! I love the simplicity of the Narcissi and that wonderful print! Those straight stems are quire striking! Beautiful photography. Thank you Terri. They do have good straight stems, which is very convenient for a vase! Your Thalia are beautifully presented. The art work is nice too. It’s such a stunning little daffodil, Joanna. Thanks for sharing. And your wonderful interior shots always take my breath away! What a nice thing to say, Cathy – thank you. I love ‘Thalia’. One of my favourites. And do beautifully staged. Thalia is one of my favourites too, such an elegant narcissus, how apt that she is one of the Three Graces, she certainly looks very graceful in your vase. Thank you Chloris – I thought it was apt too.